Arlen Solem has lived on the South Side of Milwaukee for two years. A husband and father, Solem said he wanted a safe environment nearby where he and his family could experience the great outdoors. Solem found such a place in the Menomonee River Valley. Laura Bray, executive director of Menomonee Valley Partners, wants more Milwaukee residents to have experiences similar to those of Solem and his family. “(We are) just trying to figure out how do we get more people to discover all of the things that are going on in the valley,” Bray said. The group is administering a survey to gauge people’s impressions of the valley, which will help to inform a branding initiative, she said. Also, Menomonee Valley Partners and the Urban Ecology Center, which opened a third site in the valley in September, are offering free tours of the center and the surrounding area on the first and third Wednesdays of the month from 10 to 11 a.m. Founded in 1999, Menomonee Valley Partners works to restore the valley to its natural beauty for the benefit of the entire Milwaukee community. Corey Zetts, the organization’s associate director, cited three key areas that the organization has pinpointed to accomplish this goal. “The vision is to (improve the valley) economically, by creating strong jobs close to workers’ homes; environmentally, by restoring the river and green space; and then culturally, by creating connections to the surrounding neighborhoods,” Zetts said. She said the nonprofit organization has made considerable progress in all three sectors, but the environmental enhancements have been the most dramatic. In addition to its many environmental improvements, Menomonee Valley Partners has enriched the cultural climate of the valley by sponsoring Beyond the Canvas, organized by Menomenee Valley Partners with the Milwaukee Artist Resource Network. 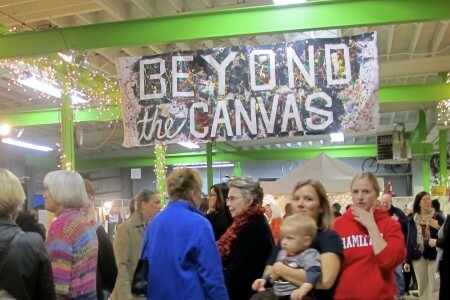 The third annual Beyond the Canvas event was open to community members from across Milwaukee. By drawing from a geographically diverse population, the organization drew attention to its continuing work in the valley.